A PREACHERS MAP OF SCAMS AND IRISH FOLKLORE. Companies whose sales people think I can not get on with my life without their product or service – If I want it I’ll google it – stop phoning me! The visit of the Irish Poets. Physical Graffiti – Led Zeppelin. In the week that Ireland elected a poet as their President, we have three poets from Cork visiting the UK this week. I wanted to get my poems inspired by my trip to Cork finished so that I can read them at Nightblue Fruit and The Fizz. I had started three and none of them were forming how I wanted them too, so last week, I decided to make a concerted effort to bring them to fruition. As I have said before I have to walk with my subjects going around in my head developing the themes in a negotiation between my conscious and sub-conscious, it is only when agreement is reached between these two factions that I can put my words to paper – or in modern parlance to the computer screen. The first poem Cork City, the theme takes as its title suggests, the city and its culture, where I wander the streets seeking out its spirit, trying to shake out its psyche. My problem with this poem was the amount of themes and detail associated with this great city is massive and deciding what to include or leave out was the issue that I struggled with. My focus was finally drawn by an article written by one of the Cork poets, Afric McGlinchey in the Aer Lingus magazine, where she described Cork “as great place for poets to live”. This allowed me to tease out the details that were relevant to a poet, to see the place with an eye to its activities now with mere hints at its history and heritage. The second poem, I started first, the themes being conceived when I was there, but although I had some clear thoughts, the final poem did not develop until the first one was completed. 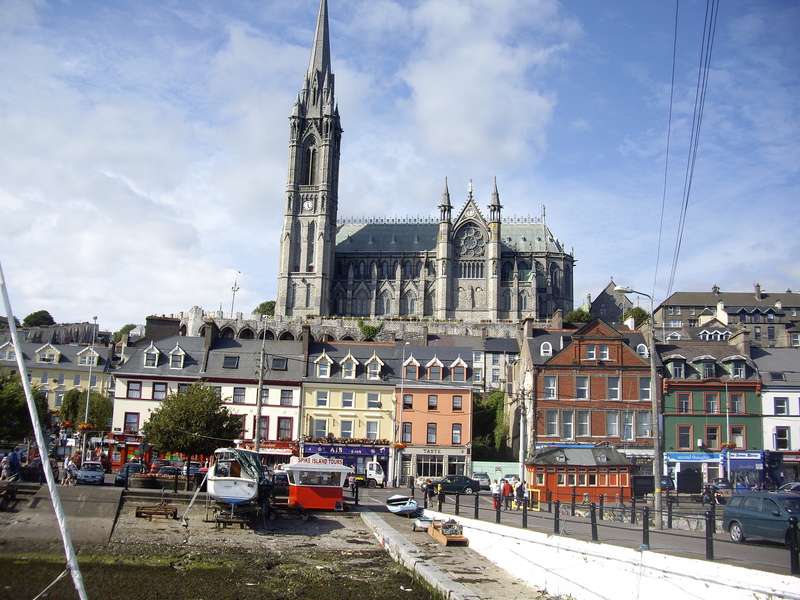 The poem, Cobh – The last Cathedral, takes its theme of the main harbour about 10 miles from Cork City, Cobh (pronounced Cove) was the main departure point for the ocean going liners heading for the Americas. Indeed the Titanic sailed from here in April 1912 before she met her fate in the Atlantic wastes. 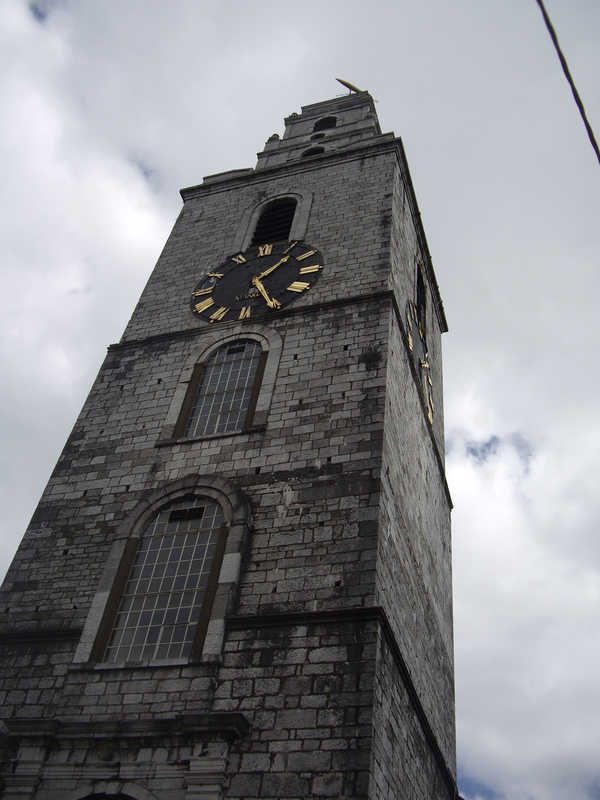 The town is dominated by St Colmains Cathedral; it would have been the last land based structure that the Titanic passengers would have seen. It was the power of this image that drew me in. Many people left Ireland for the Americas during the potato famine; this would have been the last piece of their homeland that they would ever see. It is a very powerful symbolic reference point. The third poem The Grange Circle Bodhrani has become a folk tale, which I feel a bit nervous about as an Englishman, should I be creating new folklore for an ancient sacred site that is not in my own land? The Grange Stone Circle is the largest in Ireland and the Black Stone, which forms part of it, is Ireland’s Largest Monolith. Paul Casey and I spent some time standing between the stones discussing its significance. The alley where the light shaft enters the circle on the longest day is clear but the lightstone that the light would hit is smothered by an Ash tree, as if this is breaking the magic. It is an enchanting place, a place of well respected folklore already; it perhaps does not need mine. It is said that the local people will not go to circle after dusk because from dusk to dawn it is the domain of the Fey Folk – the fairy folk, who are to be left to their world. My poem tells of a bodhrani as drummer with his Bodhran, who with his kin of fiddlers, flautists and dancers was so lost in the beat that he did not notice that dusk had fallen. This angered Oberon King of Fey who saw them as being disrespectful. So in a thunder charge he used lightening to strike the cipin – the stick from the Bodhrani’s hand, which Oberon sent spinning around the circle turning the humans in to stone. The Bodhrani becoming the Black stone – Finally the stick rests at the foot of the lightstone and from this the Ash tree grows and kills the magic known to humans. Now the drummer and his clan cannot see or hear the day, but at night they dance to the Fey Folk’s tune, they are the jesters, entertainers, playthings of the Fey. 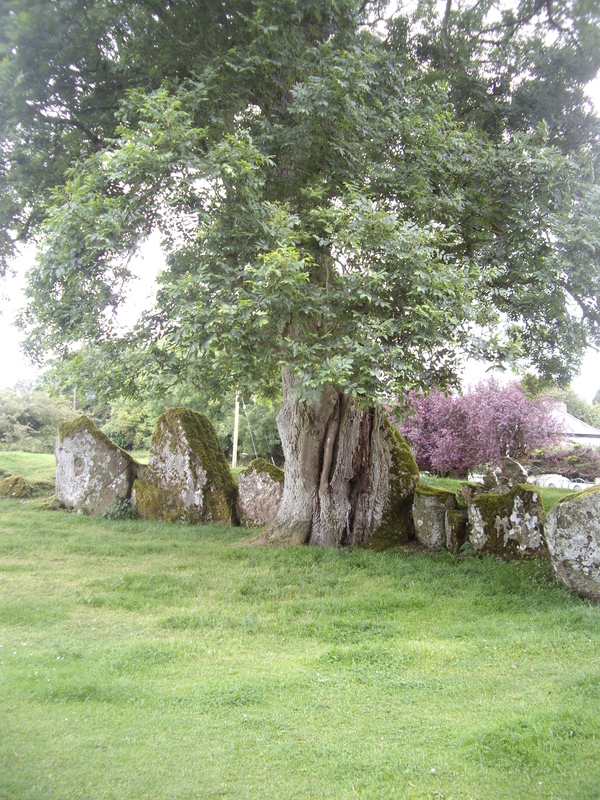 The Grange Stone Circle - The Ash Tree smothers the light stone. Afric McGlinchey, Colm Scully and Jennifer Matthews will be reading at Nightblue Fruit at Taylor John’s House The Canal Vaults in Coventry on Tuesday 1st November – 8:00pm and at The Fizz 10 at the Tithe barn in Polesworth on 3rd November – 7:30pm – followed by an interview and reading on Hills FM Radio on Friday 4th November between 11:00 and 12:00. There will also be readings from Antony Owen, Barry Patterson and Myself who have all been representatives of Coventry on the Coventry-Cork Literature exchange over recent years. The poetry of scam emails. My poetic endeavours have not just been focussed on Cork. I turned my attention to a series of spam emails, which I regularly receive from persons supposedly in privileged positions at the Bank of Burkino Faso, who have through their daily work come across millions of dollars that no on knows about, offering to cut me in if I will assist with my bank account details so that they can transfer the money. I am sure that many of you will have received similar emails and that like me you know they are a scam. I do wonder about these poor deluded emailers, has no one told them we know what they are up to and that they are wasting their time, we are not going to bite. I had six in my spam box last week, and took some time to read them, and to look at the language they used, the old fashioned phraseology, the sad picture they paint. It occurred to me that there was something poetic about them, that I could take lines and phrases and create a poem, a poem that used this interesting language, which had the feel and sadness of the emails, but in some way was more of a truth than the originals. I felt that something creative should come from these manipulative, fraudulent minds, that their misguided efforts should not be wasted. I will be reading my poem PLEASE DO WELL TO REPLY TO ME AS SOON AS POSSIBLE. at Nightblue Fruit tomorrow evening in Coventry along with my new Cork poems. The Nine Arches Press are running a full programme of workshops throughout the Winter and into the Spring in Warwick. The workshops are designed to enable poets to learn more about poetry and to gain in confidence in their poetic endeavours. They will be run by Jane Commane and Matt Nunn two of the most respected poets, editors, publishers and workshop leaders working in contemporary poetry. There is a New Folk and Poetry event in Ashby de-la Zouch. The Goblin Folk and Poetry Club is to be a monthly event with the first on the 15th November at the Giggling Goblin Coffee Shop, Mill Lane, Ashby – it starts at 8:30 to 8:45pm with a licensed bar and great coffee. It will then be on the third Tuesday of the month. The event is hosted by Brian B. Langtry, who tells me he ran a poetry and folk club in the Black Country in the Mid 1970’s, which ran until the pub closed down. Brian has always been keen to mix the arts and has decided to give the Folk and Poetry format a revival in Ashby. As Brian’s flyer says the Performers are from the audience. I hope it attracts some of the Leicestershire Folk singers who gave an impromptu performance in the bar at the Pitman Poets gig a few weeks ago then the audience is in for a really fantastic night and of course there will be us poets who will cast our metaphor and simile out to the eager listening ears. John Rawlet - Poet and Preacher. John Rawlet, poet and preacher, he was not by any means a major poet, a single volume of his poetry was published a year after his death. His main contribution to history is as a preacher, in Wigan, Kirkby Stephen and Newcastle upon Tyne. He is remembered through the name of a School in his home town of Tamworth, now in wholly in Staffordshire but at Rawlet’s time, Tamworth was split between Stafford and Warwick, a time of the English civil war that saw the town divided between Parliamentarians on the Stafford side of town and the King on the Warwick side. Rawlet was born into an agricultural family with its origins near Grendon in Warwickshire; his father was a wool trader and settled in Tamworth as a major centre of commerce. The Rawlett family name was spelt with two ‘T’s – it was John who styled the name with one and adopted this throughout his life. Rawlet was educated at the towns Grammar School and came under the tutelage of Samual Shaw a Cambridge graduate who nurtured his calling into the church. The church at these times was a turbulent place as there were divisions between the conformists who were restored to their livings following the restoration of Charles II and had signed their allegiance to the crown and the non-conformists who had used the churches for their services under the Commonwealth of Cromwell and would not sign up to the King. 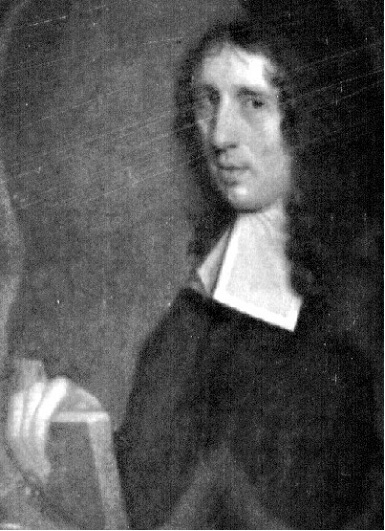 Rawlet entered Cambridge to study theology, and it is understood that he became well read; although he did not receive his degree at the time he was expected too, there is a period in his life between 1660 and 1665 where there is scant knowledge of his whereabouts. It is during his period at Cambridge that he writes his first verses many he dedicates to his mother. He reappears in 1666 in London, It is the time of the great plague and he fears he may succumb to it, he writes a letter to his mother saying goodbye and how he feels saddened that he has not achieved his ambitions. The letter is never sent, but remains with his processions until some 30 years later. His thought presumably that on his death it would be found and sent to Tamworth. He is a tutor with a family at this time and is saved from the plague by the family moving to a country residence in Croydon – this also takes him away from The Great Fire of London which destroys the city later in the year. Taking with it many great libraries. Through the talk of books and lost collections, Rawlet sees that men who have been published have greater opportunities and so publishes a small book with the help of Richard Baxter, A Sacramental Covenanting with Christ under the initials MM. Baxter’s ‘Letter to the Reader’ aimed at providing religious instruction to the common poorly educated people. He his mocked by Baxter who describes him as “the Captain of the ignorant”. Despite this his book proves very popular with the rich who purchase copies to distribute to the poor as charitable gifts. It is not long before he is offered a living in Wigan, which accepts and holds for a couple of years before he is offered a position in Kirkby Stephen in Westmorland. His patron is Phillip Wharton (4th Baron Wharton). Westmorland (now Cumbria) is also Clifford country and Rawlet is delighted with his meeting with the dowager countess Lady Anne Clifford, who her self has purchased his book and distributed it to the poor of the north. Following his time in Westmorland he is offered a position at St Nicholas’ Church in Newcastle upon Time, then a parish church and now the cities Cathedral. It is here that he finally succumbs to illness, marrying his long time friend Ann Butler some three days before his death in 1686. His friends gathered together his poems and published them the following year as Poetick Miscellanies of John Rawlet, B.D. and Late Lecturer Opoetic Miscellanies of John Rawlet, B.D. and Late Lecturer of S. Nicholas Church in the Town of Newcastle upon Tyne. His legacy created the Rawlett Trust, which still exists today and annually pays out sums to those who meet the conditions of Raw let’s original intentions. The school in Tamworth, now Rawlett Community College, was built on Rawlett Field a piece of land that was once owned by the trust. The school and trust both adopting the original spelling of the family name. The school and the trust continue to perpetuate his name, his poetry however is mostly forgotten, the light verses on pastoral and religious themes show a poet whose craft was well developed, he chose not to pursue his life as poet but that of a preacher, this should not diminish his skill as a poet which can be seen in the on-line scanned copies of his verse published by his friends. Online copy of Rawlet’s poetry at Virginia University. 1st Nov – Night Blue Fruit – Taylor John’s House Coventry – Guests The Cork Poets. 3rd Nov – The Fizz – Tithe Barn Polesworth. Guests The Cork Poets. 22nd Nov – Poetry Bites – Birmingham. An afternoon of poetry workshops run by local poets Antony Owen and Mal Dewhirst. Coventry schoolchildren will use war poems from Owen’s “Dreaded Boy” and selected famous war poetry to explore the themes of peace and reconciliation today. Influenced by what they have read and discussed the young people will create a collaborative poem as well as their own individual poems on what peace and reconciliation means to them. The poems will then the subject of an exhibition throughout the rest of 2011 in the Central Library. It is hoped that this exhibition will go on to show at other venues at a later date. Time: 12noon – 4.00pm – This event is by invitation only through local Coventry Schools. WITH ALL THE GRACE THAT’S DIEU. The very disappointing ending to SPOOKS! There have been several great further responses to the debate on a Staffordshire Poet Laureate, for which I would like to thank those who offered their thoughts. There are 3 or 4 active people on the Staffordshire Literature scene who are interested in working with me to engage with the appropriate authorities to see if we can move this forward. Therefore I propose to work with them to see what we can achieve. I will of course let you know the results through this blog. Poets can still contact me through my email address maldewhirst@yahoo.co.uk with any further thoughts. This last week has seen me working on ideas for future projects which are all very tentative at the moment and I need to think about which I want to pursue and how they will be part of achieving the things that I want to do, the things that I enjoy doing. I also found that I had done enough walking of the subject of my Cork poems following my trip and readings back in August; I now have one completed poem and another partly drafted. I would like to get them finished ready for when the three Cork poets visit the UK next week as part of the Coventry Cork Literature exchange. The Cork Poets: Afric McGlinchey, Colm Scully and Jennifer Matthews will be in the UK from the 1st to 5th November, with a reading at Night Blue Fruit in Coventry on 1st, a meeting with the Mayor of Coventry, a tour of the Polesworth Poets trail and reading at the Fizz in Polesworth on 3rd finishing with a reading and interview on Hills FM on Friday 4th. Details for the Fizz10 are on the poster below. The Runaway writers have been invited to play a part in the Short Story week events being organised by the Grace Dieu Writers Group in Coalville Leicestershire on 10th November. The evening will be a meeting of four writers groups with the Charnwood Writers and the Ashby Writers also taking part. Each group has selected 3 short stories from their members to take along to be read to the audience on the evening. My short story about Absinthe drinkers – The Green Fairy, along with Kirstie Brooks story – Chocolate and Dea Costelloe’s story -Taking Her Chance were all selected by the Runaway Writers members to be the stories we will take along. I am really looking forward to meeting with other writers in the Midlands; it is rare that these opportunities occur, where we can share our work with a wider readership. Writers groups tend to get focussed on their own activities, which after an initial momentum of excitement and expeditions developing writers into breaking new ground, can often see the group settle into a comfort zone as the momentum does not progress beyond its initial force. New members can often bring a new vitality to prevent stagnation but new members are not coming along all the time and it would be a lot to ask of them to bring a new dynamic to the group; many are new writers and are looking for help and guidance which the group can give them. I have always seen The Runaway Writers as a progressive group, who have always sought to network and collaborate with different groups and to try and keep things fresh and to push individuals into writing realms which they would not have otherwise considered. Through the support and attitude of the members writers are encouraged to experiment. An evening with these other well respected writing groups is most welcome, it not only allows us to benchmark our work against other pieces being produced by local writers, it also develops new friendships which are always welcome. I would like to thank the Grace Dieu Writers for organising it. Tonight (Monday) sees me reading at the Shindig at the Western in Leicester as one of the guest poets alongside Jane Commane, Charles Lauder and Wayne Burrows – I am really looking forward to it, it is an event that I have been to a couple of times, it always has an appreciative audience and some great poets reading from the floor. My interest in Sir John Beaumont the first baronet is many fold, he was not only a contemporary of Michael Drayton but also a good friend. He was born at Grace Dieu Manor close to the Priory from which the Grace Dieu writers mentioned above take their name. It was his son also Sir John who published the elders poem of The Battle of Bosworth, which is also of interest to me due to my Yorkshire ancestry. Sir John was born in 1583 and at Grace Dieu Manor in Leicestershire, He was the second son of Sir Francis Beaumont and Anne Pierrepoint, He was educated at Oxford University, which saw him admitted to the Inner Temple at around 1600. 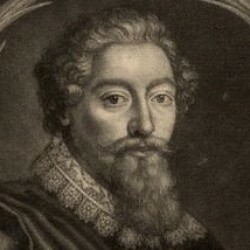 Following the death of his father and then his elder brother he found himself the head of a creative family, his younger brother was the dramatist Francis Beaumont who was also acquainted with Drayton and was a student of Ben Jonson. Grace Dieu is not that far from Polesworth in Warwickshire and it makes me wonder if the Beaumont’s were ever guests of the Goodere’s and the Polesworth Circle. Sir John lived for many years as bachelor eventually marrying a Catholic, Elizabeth Fortesque; their sympathies towards the Catholic faith saw them fined for recusancy for refusing to attend Anglican services. He began writing poetry in around 1602 – in his poem Metamorphosis of Tabacco, a mock heroic poem in smooth couplets which he published anonymously, which he dedicates to both his brother and to Michael Drayton as his loving friend. His poem on Bosworth with its heroic couplets whilst a fine piece of Elizabethan verse, pales a little in the comparison of that of Shakespeare’s treatment of the subject in Richard III. It is the focus on this single event in the Wars of the Roses that makes it interesting. The content has differing detail to Shakespeare and while not contradicting – it adds more colour to the picture of this battle. It is also worth considering the sources of Beaumont’s version, presumably some of it from Shakespeare, who in turn used Holinshed’s chronicles, which Beaumont may also have referred too. But let’s not forget Grace Dieu is only a few miles from Bosworth, that Beaumont will have had access to some of the family histories, the stories passed down through the Digby’s of Coleshill for example. These may not have been available to the commoner Shakespeare and so therefore Beaumont is able to add further detail, be it second or third hand, but never-the-less some elements of truth surrounding the events of the 22nd August 1485. Sir John died at Grace Dieu in 1827, he was succeeded by his son also Sir John, he was killed at the Siege of Gloucester in 1643 and was succeeded by the third and final Baronet of Grace Dieu Sir Thomas, on whose death in 1686 the Beaumont Baronetcy of Grace Dieu was extinct. But this is not the end of the link with poetry and Grace Dieu – for a new creation of the Beaumont Baronetcy saw the Beaumont’s of Staughton Grange, who made their home at nearby Coleorton Hall, The 7th Baronet Sir George Beaumont was keen artist who befriended the Lakeland Poets, It was on a visit to Coleorton Hall that William Wordsworth wrote these lines on Grace Dieu Priory. 24th Oct – Shindig, Leicester.– I will be a guest poet at this event. 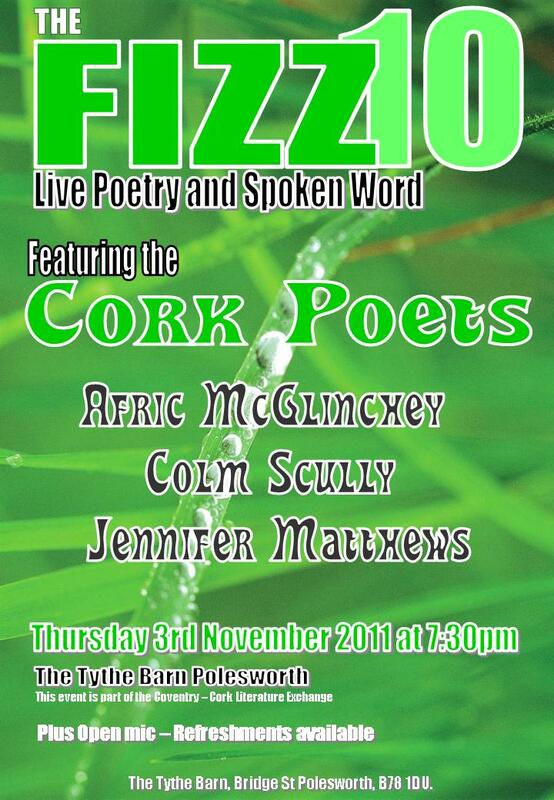 The next Fizz is on THURSDAY 3rd November at the TYTHE BARN in Polesworth when we will have as our guest poets Afric McGlinchey, Colm Scully and Jennifer Matthews from CORK in Ireland. Please note that this is a change of day and location from the normal Fizz events. TAILCOATED LAUREATE RAMBLINGS IN THE MOORLANDS. A country walk on Sunday afternoon. The new tracks from Hydranoid Musia. There has been quite a few responses on the debate I started last week with regard to whether Staffordshire should have its own poet laureate. The responses are all from poets, most of whom would be eligible to apply for the post, if it comes to fruition. It was also great to get the views of a poet from outside of Staffordshire, who whilst recognising they would not be able to apply felt that they could add to the discussion on the role of a local laureate in general terms. The idea has been met with a great deal of enthusiasm for the role and what part a laureate can play in promoting Poetry, Literacy, Heritage and the County. In general terms the discussion is around what qualities and experience should the Poet Laureate have and should this differ from year to year to ensure the whole spectra of poetry is aired. Is it a page poet or Is it someone who win slams? Or someone that’s an all round good performance poet? Is it important that they can/want to go into schools to promote poetry to young people? Should they have a wider poetry knowledge/understanding of e.g. metre, past poets and be happy and able to promote page poetry as well as performance poetry? Should the poet be a good poetry audience member, listening and encouraging, mentoring and supporting. My view is that different poets will bring a different focus to the role; all are valid and should be celebrated for their style. But what ever the specific poetic style the poets use, they should be able to demonstrate a good understanding of its roots and development and have ideas as how if can developed and how collaborations with other poetic styles and art-forms could be pursued. It has also been suggested that consideration should be given to whether there is an expectation for the Poet Laureate to actively promote poetry. Different regions have differing ideas on this; Worcester gave no expectation beyond a performance in the Cathedral, where as Birmingham has a contractual expectation that the poet will achieve agreed criteria during the year that they hold the post. This is part of the entry criteria with poets having to specify what they would want to do and where and who they would encourage to participate. The more specific points that have been raised relating to Staffordshire include linking the post to Library Service, which seems eminently sensible, as the libraries across the county can promote and run events and also to a certain extent have their hands on the pulse of the local communities. This also offers an opportunity for the poet to be in residence at libraries and even touring the districts on the Library bus, encouraging local people to bring their poems for impromptu readings and to gather the poems for a potential anthology. There are many ideas on what a poet could do and what role they could play in Staffordshire from the poets, it will be interesting to see what the local authorities views would be for such a role. This leads me on to the issues that may or may not exist but never-the-less they are perceived as existing. These issues relate to the specifics of location and whether poets from the North of the County see themselves as being different to those in the South. The Lichfield Literary Festival would seem to be an obvious choice to appoint a laureate with readings in the Cathedral. It is an internationally recognised festival, which draws in major writers and poets, including the Poet Laureate Carol Ann Duffy. But would poets from Stoke, Leek, Newcastle feel they can relate to the City in the South of the County, That should they be appointed laureate that they would like a town or city in the North of the county to be the place where they should be crowned. How would the County town of Stafford feel about the central focus of the event being in Lichfield? As I said these are all perceptions, as no one to my knowledge has asked these questions before or even looked at a joined up collaborative thinking with regards to Literature in the county. It therefore maybe the case that people would welcome this as a means of working together rather than in the parochial groups that they find themselves in with no initiatives to take things wider. It would be down to the conditions of the laureateship that ensured that the poet’s role was inclusive of the whole of Staffordshire and not seen as the Lichfield Poet Laureate. I will leave it for another week to see if there are any further responses and then will take it forward with those who have shown an interest in forming a formal approach to the appropriate authorities. So far these are all from the south of the county and come from Poetry Groups, Spoken Word event organisers and reviewers and broadcasters. All of who are active on the local poetry scene. It would be good to get the views of the poets in the North of the county. Please pass this on to anyone who might have a view that they would like to share. 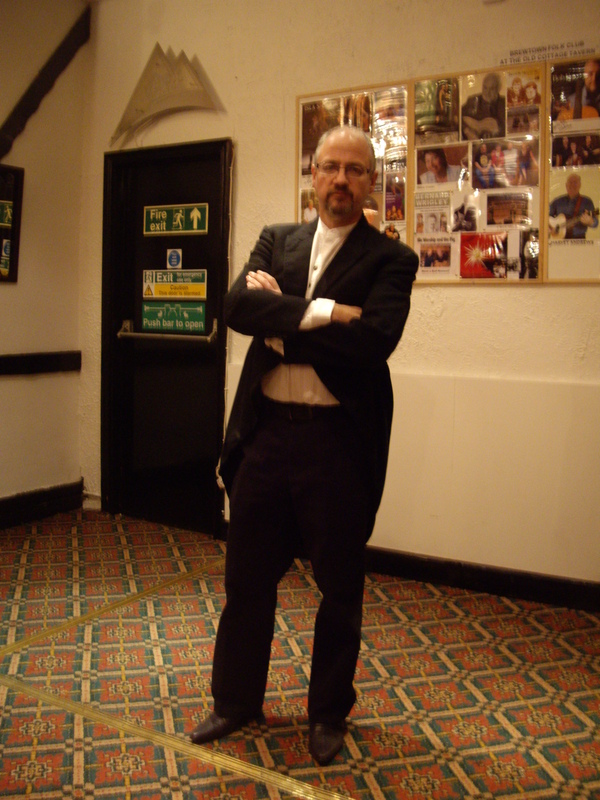 Last Friday saw the monthly Spoken Worlds evening at the Old Cottage Tavern in Burton on Trent. The usual host and organiser, Gary Carr was laid up due to illness and I was asked if I would take over the role of MC for the evening. Never one to turn down a chance to get behind the microphone I gladly stepped into the breach. I hope Gary is feeling better soon and normal service will be resumed at the next Spoken Worlds on the 25th November when the guest poet is Ash Dickinson. On Friday however, I had decided on the night to give my new tailcoat its first outing – I bought it at a Vintage clothing market in Worcester about 3 weeks ago. It is a Moss Bros, Covent Garden coat from the 1920’s/30’s and is in excellent condition, with just a fix to the lining required. It fits me perfectly and only cost £30. With my white granddad shirt, black trousers and very pointed grey, buckled shoes, I was compared to a waiter or a wedding guest, but I preferred being described as wearing my “Mad, Bad and Dangerous to know outfit”. You can judge for yourself in the photo below. Gary Longden did his normal sterling job of writing a review of the evening which can be found at Behind the Arras. Mad, Bad and Dangerous to Know??? As my main theme for the last couple of weeks has been about Poetry and Staffordshire, it seems appropriate that my lost poet should be one of Staffordshire’s great poets. The Moorland Poet, George Heath. George Heath was born in Gratton near Leek in the Staffordshire Moorlands, following his education in the village school he worked on his Father’s Farm and later was apprenticed as a builder. It was around this time that he decided to become a poet with his early verses being written in 1863. It was whilst he was working on the church in the next village of Horton that he caught a chill which developed into consumption. His illness prevented him from working and so he turned his mind to his studies and writing. His first collection, a slim volume of poems was published in 1865 entitled Simple Poems, this was followed a year later with his second volume Heart Strains. His condition deteriorated and he suffered an early death in 1869 age 25; he was buried in Horton Churchyard, the place where he had first caught the chill that brought on his early death. Memorial collections were published following his death. Including his poem to Rudyard – the lake that became a place of leisure for the Victorians. His life as a poet had lasted six short years, his poems mostly written through his illness, his words the expression of a dying man. Filled with failed ambition and loss. The themes expressed his obsession with death and his frustrations that he would not live long enough to complete his poetic journey, that his works would be forgotten and he along with them. His poem – Inscription on a Rude Stone, reflects his melancholy – lines of which were etched on his gravestone. A severing finger his projects through. Of the marvellous song the young man knew. O, ye who have feeling! a tear from you! Rest, saddest of singers, in peace—adieu! 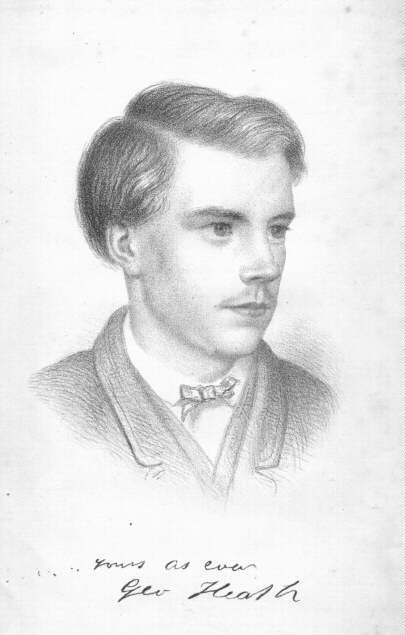 Links to pages for George Heath and his poetry. TALKING TO LOST POETS LAUREATE. The speed my grass grows – I might have to cut it once more this year! Talking to one of my Lost Poets. It was National Poetry Day last Thursday, a day that has seen over the last 10 or so years the appointment of local Poets Laureate, many of whom hold their honorary posts for the coming 12 months. Thursday saw the wonderful Jan Watts take over from the inspiring Roy McFarlane as Birmingham Poet Laureate – I have not heard who was crowned the new Laureate for Warwickshire, taking over the mantle from Olga Dermott-Bond. 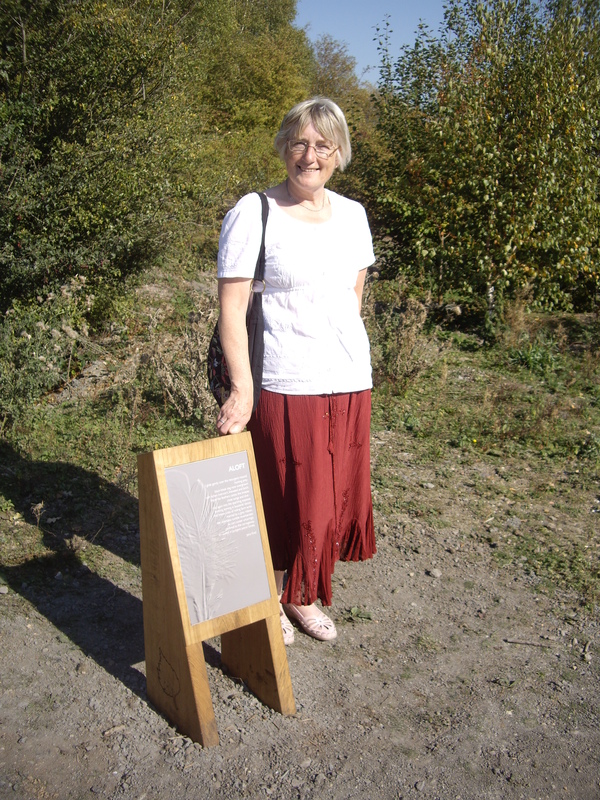 Past Warwick poets laureate have included Polesworth Poets Trail poets, Helen Yendall and Jane Holland. Worcester crowned its 1st laureate, Theo Theobald, earlier in the year from a fine shortlist that included the marvellous poets, Heather Wastie, Fergus McGonagal and Sarah James. It is worth noting that each of these events was linked to a literary festival. Birmingham Book Festival, Warwick Words and the Worcester Literary Festival. There are laureates for both Derbyshire and Cheshire, these have in the past been two year posts and have included Cathy Grindrod, River Walton, Harry Owen and Jo Bell as their holders. Matt Black was named as the new Derbyshire Poet Laureate last week. Hereford has two Young Poets Laureate with Ben Ray and Harriet Husbands. So there are murmours at poetry events, where is Staffordshire’s Poet Laureate? – Most of the surrounding counties have poets laureate so where is ours? Anyone would think that Staffordshire was a poetic wasteland but this is most definitely not the case. Stafford the town and county that raised the current British Poet Laureate, Carol Ann Duffy, does not have such a post, yet there are many fine poets who are active in promoting poetry in Tamworth, Lichfield, Burton-upon-Trent, Stafford, Newcastle Under Lyme, Stone, Stoke-On-Trent and many of the other places in the region. Local laureates do a lot of work in education, youth and health care projects as well as promoting poetry as an art-form, an art-form that I know a lot of people follow and practice, often privately but never-the-less there is a great interest. Most of the other counties include the post of the Young Laureate, giving a teenager their first major role as a poet. These posts are honorary, there is no payment made to the poets as such, they can of course be commissioned to write pieces, run workshops and hold residencies for which payment should be made. Because they are not paid for holding the title does not mean there is no value in having a Poet Laureate and indeed I would go further and say that there is a loss to the community in not having a figure head who can promote the poetic arts within the region. A local poet laureate is a cultural ambassador for the region they represent; They can promote the region’s other delights, as poets can write about anything, from tourist attractions, events, the arts, to legends to local produce, be that food or manufactured goods. They help preserve the dialects and identity of the region. Staffordshire is not just about pottery, but also about breweries, mining, league and non-league football, soon the FA academy will be here, it is also about Reliant Robins, JCB’s, ancient cathedrals, castles, the capital of a Mercia, gold hoards, battles, sieges, skirmishes, manifestos, Roman, to Saxon to Viking. Then there is the diversity of today’s multicultural environment. It is a place of nature, woodlands, moors, the chase, grit-stone crags and deep scars that became hidden churches. The Peak District also has part of its home here in Staffordshire. There is whole range of culinary classics that have had a home in Staffordshire. Beer, Oatcakes, Marmite and its cousin Bovril, Branston Pickle was first made here; there is cheese, toffee, Packington Pork, Tamworth Pigs to name just a few. Then there are the communities, the villages, the market towns and the people whose unique dialect goes back to ancient poems such as Gawain and the Green Knight. Plenty for a Poet Laureate to write about and then there are the unknown, hidden gems that only a poet can seek out and bring into the national consciousness. Local poets laureate leave a legacy of the time they hold the post and pass on the tradition to the next generation of poets. I would also offer this further case. – Three Staffordshire locations were used as part of the Great West Midlands Poetry Relay held on 23rd July this year – A cultural Olympic event – Stoke-on-Trent railway station which was the starting point, then Burton Library – then following a route through Warwickshire, Worcestershire, Herefordshire and Shropshire the final leg ended at the Pie and Ale house in Stafford. Staffordshire provided the most locations, the other counties on the route, mostly providing two locations – but I was the only Staffordshire based poet on the relay and my starting point was in Warwickshire. We need to raise the profile of poetry and the poets in Staffordshire; a Staffordshire Poet Laureate can provide this focus and at the same time promote the delights of the county. So here is a call to Staffordshire poets do we want a Poet Laureate for the county? – Should we engage with the County Council and local district councils to explore how the post could be developed for mutual benefit? Email me at maldewhirst@yahoo.co.uk with your thoughts. I need to make a correction. In my blog last week I referred to the new sculpture at Pooley Country Park with the title Burnt Sunlight, which was a mistake on my part as this had been a working title for the piece and is now a secondary title. The correct title is GOLD LEAF, so I apologise if I caused any confusion. That sorted out, I was delighted with the response that I received to the blog post, as blog comments, emails and on Facebook. The piece has certainly captured people’s imaginations and become a positive talking point and long may this continue as the piece changes from THE NEW to THE FAMILIAR and with this familiarity that it continues to inspire. Congratulations to Helen Calcutt for organising the 100,000 poets for Change event at Bloxwich Library Theatre on Saturday evening. A wonderful evening of poetry, which included some great readings from Sarah James, David Calcutt, Jacqui Rowe, Roy McFarlane, Antony Owen, Gary Longden, Janet Smith, Heather Wastie and Ruth Stacy plus readings from the floor. A very inspiring night with variations on each of the poets views on change. Friday 14th October sees SPOKEN WORLDS – the monthly reading event at the Old Cottage Tavern in Burton on Trent. The MC, Gary Carr will introduce some of the best poets in the region in the usual three halves plus some sketches and short stories. It starts as 7:30pm – Free Entry and Real Ale – not to be missed. 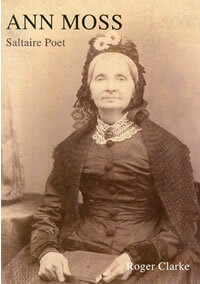 MY LOST POET for this week is ANN MOSS – (1818 – 1895). Ann Moss was a poet who lived for most of the latter half of the 19th century in Saltaire just outside Bradford in Yorkshire. Saltaire is the village built by the local mill owner Sir Titus Salt for his workers and my own family lived and worked there at the time Ann Moss was her writing poetry. Ann was a remarkable woman, who was profoundly deaf and found her self in diminished circumstances following the death of her husband, she was left to raise three children and selling her poetry was her only form of income. Despite all of this hardship, Sir Titus Salt recognised the quality of her work. The mill dominates the landscape of Saltaire, once the spinning and weaving sheds that produced alpaca woollen cloth were a busy, noisy manufactory. 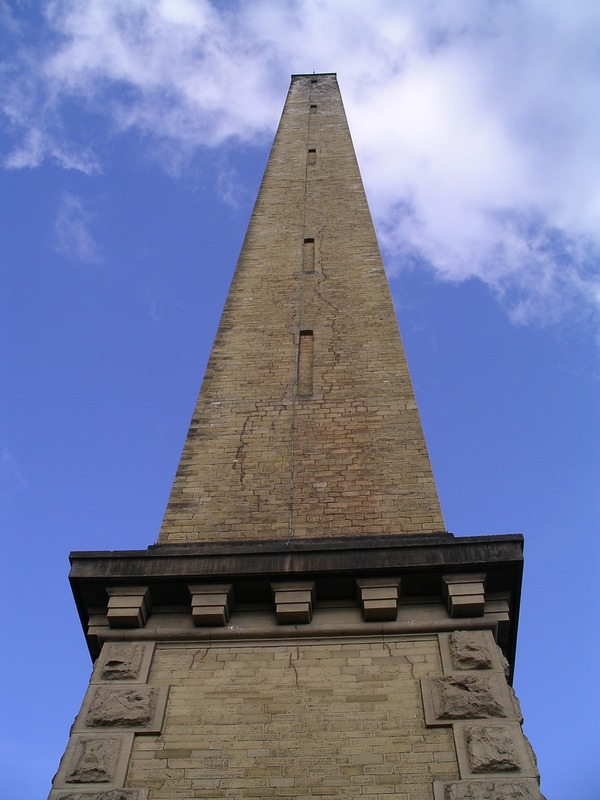 Today they are used for the production of satellite dishes, along with Café, bookshops and gallery featuring the work of another of Bradford’s sons, David Hockney. The streets that surround the mill with their neat terraces are all named after members of Salt’s family. Larger houses nearer to the mill for the over-lookers and managers, the smaller houses all were providing a comfortable living for the workers. Saltaire also has its own Institute, where Salt encouraged learning, a church and a park over the other side of the canal that provided a place for leisure. There is no pub, which is a feature of many villages that grew up around manufacturing, such as Bourneville in Birmingham which was built for its workers by the Cadbury Family. Ann’s poetry was a social comment on her times living in this community, sharing tragedy, romance and humour through the single broadsheets she produced and sold for pennies to provide support for her family. Her accounts of Salt’s Mill and Saltaire bring to life the place as it was and in appearance has changed very little it being a World Heritage Site. Her words resonate around the iron columns that stand in line to hold up the vaulted ceilings and the machine floors of the mill. You can hear the echoes of her voice in the ginnels and yards behind the houses. Ann’s poems can be found the book Ann Moss, Saltaire Poet by Roger Clarke (details below), There are family poems such as Recollections of childhood, My Father, In Memorium My Beloved Mother. Her son John in John Aged 20 and another John Aged 50. Her poems on Saltaire, such as Methley Fete and Shipley Glen. Poems on the social condition Lines to Low Moor and the Ripley Chimney Disaster. Then her lighter poems, Woman and Spotty to her cat. All these verses reflect the lives and worries of ordinary spinners and weavers, many of whom I can claim in my own ancestry. My own family had also seen the loss of a family member in Salt’s Mill, Jimmy Dewhirst who was my Great Great Grandfather died in an accident in 1860 the details of which are on the Saltaire website provided by my cousin Pat Holland. By the time my Grandfather, Ernest was born in 1888, the family had moved to nearby Shipley, but there were still members of my extended family living in Saltaire into the 1920’s and I would like to think they engaged with poetry and purchased the single broadsheets that Ann Moss produced. Ann Moss is also one of the featured poets in the GRAFT project along with Alfred Williams and Tommy Armstrong. 14th Oct – Spoken Worlds Burton. 24th Oct – Shindig, Leicester.– I will be guest poet at this event. People who moan about the insignificant things! Drums between the Bells – Brian Eno with words by Rick Holland. Last Friday saw the official unveiling of Burnt Sunlight, the much anticipated sculpture on the coal tip mound at Pooley Country Park. I and several of the other Poets Trail poets were invited to meet the artists and to provide readings of two of the poems from the new poems for the poets trail. 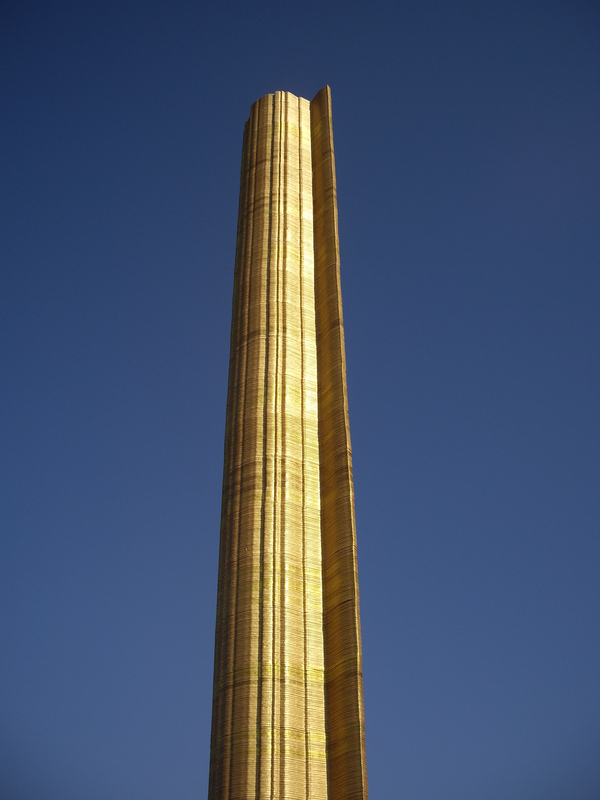 The sculpture is a wonderful golden tower of birch leaves, stacked up to 45 feet on top of the coal tip mound anchored down to a concrete foundation. Encapsulating the genius loci of Pooley Country Park, displaying its natural and human ancestry. BURNT SUNLIGHT – THE SPIRIT OF PLACE. It is a golden gnomon that marks time on the face of the mound top, an industrial sized sundial that measures the passage not in hours and minutes or even days, months or years – but in centuries and millennia. It stands as if it were the fossilized remains of sunlight, as a golden beam that shines the remnants of the solar rays that nurtured the carboniferous forest, as if it has always been there and we have excavated and removed the surrounding rocks to reveal its beautiful presence. It is as if the coal pit shaft has opened up and the light from the burnt sun is escaping back into the universe, recycled light that salutes the star that sustains our earth. It is the trunk of a lopped off Lepidodendron. The architecture of crushing tectonic pressure that forced the buried vestiges of the ancient leaves and high, bark bearing branches into fire. It stands like a three dimensional wall chart of geological strata. The strata of the fire clays, sandstones, limestones and coals, all layered as they were lain down in the brutal sculpting of our delicate world. It represents the mine shaft, where cages were lowered to bring the black gold to our hearths and furnaces. It signals the fruitfulness of human endeavour, remembers the industriousness of our fore-fathers, itself cast of furnace fire, the fruit of artistic minds, artisan skills and crafted apprenticeships. It is the birch leaf, the primary coloniser that sees Pooley Park constantly renegotiating the border between industry and nature. It is the nutrient soil, the mulch of mosses and grasses. Despite its solid, sturdiness it displays a precious fragility, it wakes you to the reality that times change and we should never hold an arrogance that suggests we understand everything. It is, It is…………..To me, it is, all of these things. I congratulate, Matthew and Louise on capturing in this gold column of leaf light, a perfect three dimensional, visual poem that shouts quietly of the spirit of place that is Pooley. It is a landmark that says things happen here; things we want to remember; things we want to think about. Pooley on Friday offered another delight as five of the new poems on the Poets Trail have been installed. The installations are made of Oak with the poems printed on to metal, each with a design to enhance and help interpret the poem. Barry Hunt’s poem the Pooley Miners’ tale is located by the wind turbine and incorporates a hand written musical score that gives it the idea of a folksong and also reflects Barry as a musician and songwriter. Janis Kind’s poem Aloft which she read wonderfully at the launch at the top of the mound, it is located where the footpaths part at the base of the mound. The design incorporates a fossilized feather as the buzzard is immortalised in her words. 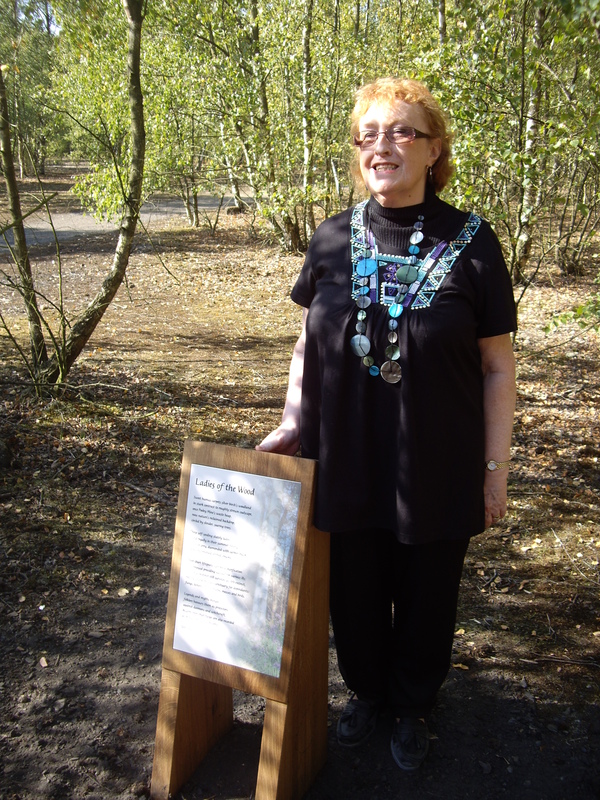 Further down the path to the Nature Reserve is Terri Jolland’s poem the Ladies of the Woods, with its images of silver birch trees and blue bells that so delighted her. Heading further down into the nature reserve between the two pools, on the right is Jacqui Rowe’s poem – Black Swan Possibility which has the image of a black swan – its head bent down to read the words. The fifth poem that has been installed is my Kite poem, which was created from the collaboration that I did with the children from Birchwood Primary School and is located in the children’s playground. More of the poems will be installed in the coming weeks and I will keep you informed through this blog. Saturday saw us venture to Snibston to the performance of the Pitman Poets. Due to a confusion over the starting time we were there an hour early and I am glad that we were, because as the audience arrived it was apparent that their were several folk singers who tour the thriving folk scene of Leicestershire (in October and November there are up to five different folk clubs that meet every night of the week). At 7:00pm that started a sing in, in the bar, voices that told tales of lost loves and travelling, but the songs that resonated with their pitch perfect harmonies were the mining songs of community, danger and comradeship – the unity songs from the Miners Galas. These powerful stirring songs which alas are no longer sung by working miners following the pit closures in the 80’s and 90’s are kept alive by a new community of folk singers. Absolutely wonderful. I am so glad we didn’t miss it and I only wish I knew the words to be able to join in. There was also a notable performance of a song from a Mother and her two teenage daughters, a song, that again I am not sure of the title, they were joined in a harmonious chorus by the rest of the group. I pity the people who stayed in to watch the X Factor, because being with the singers and musicians from the Leicestershire folk scene was where the real music was on Saturday night. The Pitmen poets, Billy Mitchell, Bob Fox, Benny Graham and Jez Lowe, did not disappoint either, singing the songs of my lost poet Tommy Armstrong, plus those of other North East songwriters mixed in with their own songs and comic banter. This was set to a background of the harmonious folk singers from Leicestershire who joined in at each chorus. There were songs of loss and protest, notably Tommy Armstrong’s – South Medomsley Pit Strike. Comic songs about Stanley Market and a flood at Stanley which was perhaps over exaggerated by Tommy. Jez Lowe performed two of his very poignant songs – The Last of Widows, that told of the death of the last widow of a 1950s mining disaster and how she was now reunited with her young mining man. The Judas Bus told of the miners who did not strike in the 1980’s and continued to work travelling into the pits each day on armoured busses. An act that had repercussions, an act that split communities and close knit families. Billy Mitchell, once the lead singer with Lindisfarne, performed songs about his mining roots – The Devil’s Ground and Shiftin to the Toon. It was a fantastic musically evening of songs, which I bought on CD after the show and then got the Pitman Poets to sign them. It was great to hear Tommy’s songs, sung in his dialect and accent giving me a mass of ideas for the GRAFT project, which includes Tommy as one of the poets providing the inspiration along with Ann Moss and Alfred Williams. Tuesday 4th Oct 8:00pm – Night Blue Fruit at Taylor John’s House, Coventry with guest poets Janet Smith and David Calcutt – Bar and Open Mic – Free Entry. Also To mark National Poetry Day on Thursday, 6th October, there will be a reading of John Clare’s poetry and other writing in front of All Saints Church, Northampton (it has a portico!) at 7pm. John Clare lived much of his life around Northampton and is one of my lost poets – see blog post 13th June 2011. Birmingham Book Festival also starts on Thursday with a packed programme of events – see the website for details. 4th Oct Night Blue Fruit – Taylor John’s House Coventry. Guest Poets Janet Smith and David Calcutt. 8th Oct – 100000 Poets for Change – Bloxwich Library Theatre.